California's Del Mar Times reports that Girl Scout and Rancho Santa Fe resident Veronica Nelson was is this year’s Operation Thin Mint’s top cookie seller, clocking in at a whopping 4,082 boxes! Roni — along with Melissa Thomas of Rancho Santa Fe (3,009 boxes) and Caroline Sanborn (2,012 boxes) of Carmel Valley — were honored with other top cookie sellers on May 12, at Girl Scouts San Diego’s 11th annual Operation Thin Mint Sendoff aboard the USS Midway. As top sellers (defined by those who reach 2,012 or more boxes sold in 2012), the girls had the opportunity to ride in a helicopter at OTM and join other VIPs on stage and at a special reception. 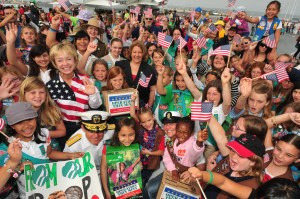 Since 2002, San Diego Girl Scout troops and their cookie customers have sent more than 2 million boxes of America’s favorite cookies and countless notes of support to deployed troops serving in Afghanistan, Iraq, Africa, Japan, Korea, and the Persian Gulf, Western Pacific and Indian Ocean.